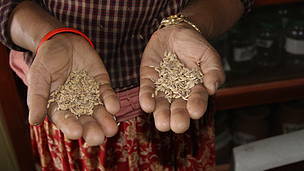 In the next five years, WWF Nepal will undertake adaptation and mitigation strategies to build the resilience of vulnerable ecosystems and communities to climate change. The major focus will be on energy and food security for conservation and sustainable development. This will be done through a three-step approach. The seed bank project helps us adapt to climate change happening around us. Firstly, WWF Nepal will continue to enhance its understanding of climate change through research studies, build its capacity and the capacities of others at national, landscape, and community levels. WWF will also carry out campaigns to strengthen policy and awareness. Adaptation projects will be implemented to help build resilience of local communities and ecosystems. WWF Nepal will also train and work with local citizen scientists as a means to build local capacity in understanding climate change issues and building the resilience of communities. Secondly, global carbon financing will be accessed from renewable energy projects so as to establish a sustainable financing mechanism for local communities. WWF Nepal will also constructively engage in forest carbon issues (REDD+), to help establish an equitable benefit sharing at both the local and national levels while ensuring that social, economic, and environmental safeguards are met. 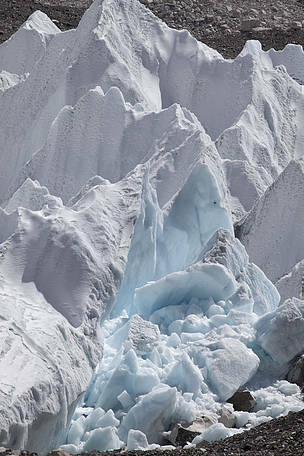 Melting glacier in the Everest region shows us the effects of Climate Change. GOAL: BY 2021, THERE IS A PARADIGM SHIFT TOWARDS CLIMATE SMART CONSERVATION AND SUSTAINABLE DEVELOPMENT THROUGH INVESTMENTS, INNOVATION, LOW CARBON PATHWAYS AND BUILDING RESILIENCE OF LOCAL COMMUNITIES AND ECOSYSTEMS TO CLIMATE CHANGE.